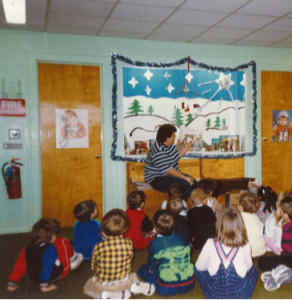 I have wonderful Advent memories attached to my many years of teaching in various country towns and working in our Divine Child kindergarten (in western New York state) for 25 years. Little children are so precious and full of awe. Each Advent I would set up a small manger with no hay. During our Advent prayer time on the mornings that followed, we would have a little prayer, open the day on the Advent calendar, and put in as many pieces of straw that matched the number of special good deeds of each child from the day before. The children would share what special things they did and I was always touched by their sincerity, eagerness, and joy. Their deeds stretched from helping mom and dad to tying a younger sibling’s shoes or putting their toys away. Then we would have our annual Christmas play for the sisters and all our families and friends. By this time, all their faces were beaming as the manger was overflowing with hay, which made a beautiful bed for the baby Jesus. They loved to look at both the large picture and the kneeling Santa statue, with his hat off, kneeling to Baby Jesus. So tenderly, many of them would bow their heads and blow a kiss to baby Jesus. What greater gift could I have received, but the love, joy, and lessons from these little ones.